'Desert Snow' ( Paul Black, R. 2013) AB, OGB-. Seedling R159B. AB (OGB-), 25" (64 cm), Midseason to late bloom. Standards and style arms ice-white; Falls same, 1" blue-black aril signal; beard hairs based white, tips light yellow. 'Lancer' X 'Open Your Eyes'. Mid-America 2013. Honorable Mention 2015. Walther Cup 2015, Award of Merit 2017. 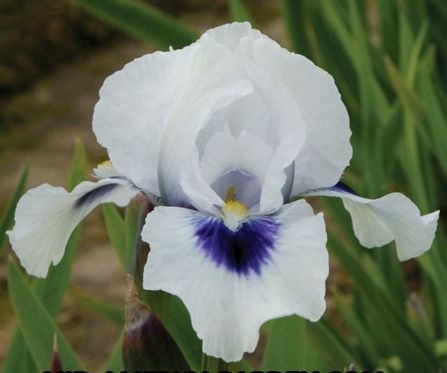 From Mid-America Garden catalog, 2013: DESERT SNOW (Black ‘13) AB OGB- arilbred-median Midseason-Late 25” (63cm). Easy and strong growth. One branch & 3-4 buds. Sdlg. R159B: Lancer X Open Your Eyes. $25.00. jpg BHP_5345-X2_desert_snow.jpg manage 126 K 11 Feb 2016 - 19:57 BrockHeilman Please contact Brock Heilman for image use.